GBPA Conchman Triathlon Date Announced- Sarah St. George, GBPA Acting Chairman, announced in a press conference this Wednesday, that the annual GBPA Conchman Triathlon will be held Saturday, November 3rd, 2018. 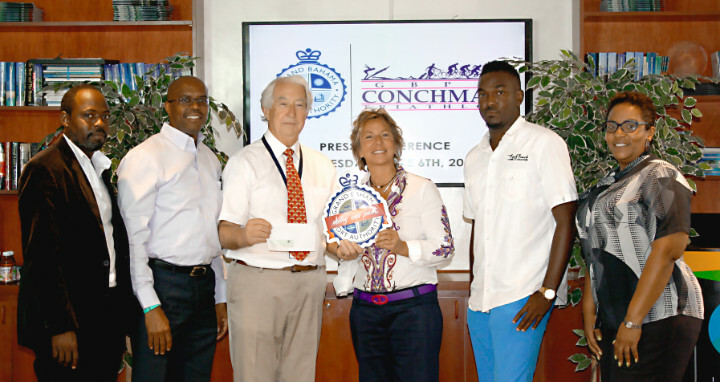 St. George expressed pleasure that GBPA is the title Sponsor for the Conchman for the third year running. She stated. “It’s one of our favourite sports event as it combines three athletic activities – running, biking and swimming. It’s part of Grand Bahama’s history now!” Pictured L-R: Ravanno Ferguson, Fast Track Management and Conchman Triathlon Committee Member; Christopher Baker, Chairman of Conchman Triathlon; Sarah St. George, GBPA Acting Chairman; Charles Pratt, GBPA Sr. Manager and Conchman Triathlon Committee Member. Freeport, Bahamas - – The Grand Bahama Port Authority (GBPA) is delighted to be the title sponsor of the 2018 Conchman Triathlon event, for the third consecutive year. Since inception, the Conchman Triathlon always takes place on the first Saturday of November each year and is a successful and long-standing event on Grand Bahama Island. This year marks the 32nd Annual GBPA Conchman Triathlon, which will be held on Saturday, November 3rd, 2018 at Taino Beach. Official Cheque Presentation- GBPA Acting Chairman, Sarah St. George, presented Conchman Triathlon Chairman, Christopher Baker, with the donation for this year’s event. GBPA announced their continued support of the sporting initiative, through their Title Sponsorship for the third consecutive year. Pictured L-R: Troy McIntosh, GBPA Deputy Director of Building & Development Services/City Manager and past Olympian; Charles Pratt, GBPA Sr. Manager of Sales & Commercial Development and Conchman Triathlon Committee Member; Christopher Baker, Chairman of Conchman Triathlon; Sarah St. George, GBPA Acting Chairman; Ravanno Ferguson, Fast Track Management and Conchman Triathlon Committee Member; Dionne Britton, GBPA employee and Grand Bahama Amateur Athletic Association (GBAAA) General Secretary. Sarah St. George encouraged everyone and particularly school students to start thinking about putting their teams together. You’ve heard the early bird catches the worm, and early registration is cheaper. This year there will be breakfast and lunch provided by The Rotary Club, cold drinks and Sands Beer for the grown-ups, music and entertainment. There will be great prizes for the student teams this year. So once again, we need lots of high schools to participate. Ravanno Ferguson of Fast Track Management, encouraged the Grand Bahamian community to visit the website: ‘active.com’, to sign up for early registration. He spoke to “the expected increase in participants for this year’s event, not only on a national scale, but casting the net as wide as America and Europe.” Charles Pratt, Senior Manager of the Grand Bahama Port Authority, and Conchman Triathlon Committee member, views this event as “a great opportunity for local and national involvement and support, as well as a means to showcase athletic talent amongst our youth.” Pratt also stressed the importance of the Conchman from a health perspective and emphasized how crucial it is for people to remain healthy and active in order to combat the various non-communicable diseases that plague our nation’s population.